Farningham Wood is famous for its pretty and rare Deptford pinks (Dianthus armeria) that adorn the southern edge of the large woodland. The Kent Rare Plant Register tells the story of the plant’s history and distribution in the county well. I have been to look for it twice and each time failed miserably in my quest. On the first occasion, in early June, I mis-read the map and neatly by-passed the area and may even have been a trifle early. I did find abundant common spotted orchids (Dactylorhiza fuchsii), yellow rattle (Rhinanthus minor) and a single, tatty green hairstreak (Callophrys rubi) in an old meadow and enjoyed the cool heart of the ancient woodland. 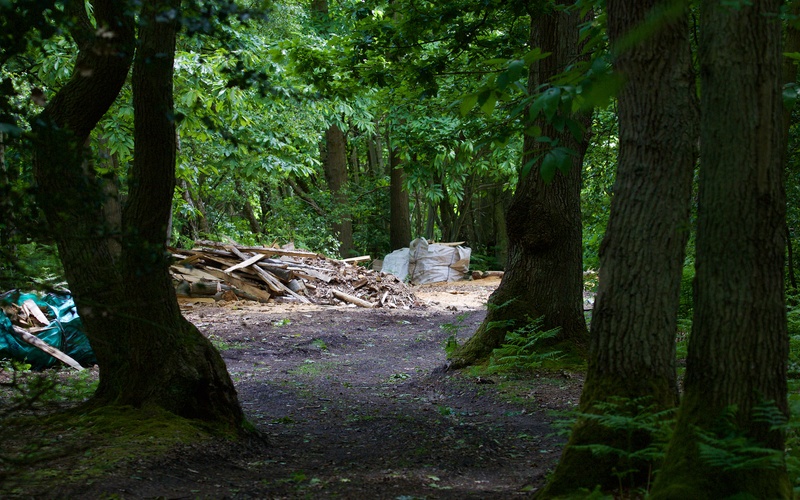 The dark heart of Farningham Wood. The second visit just the other day, was thwarted by the minuscule but all powerful oriental chestnut gall wasp (Dryocosmus kuriphilus). This is a new and much anticipated arrival from the east and has landed in the extensive areas of sweet chestnut (Castanea sativa). The galls that house the larvae spoil both chestnuts and timber and weaken the trees. 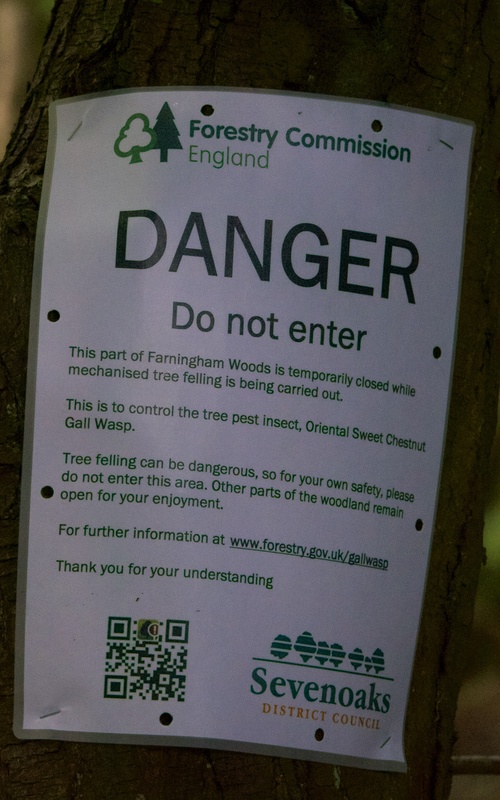 The species is being hurriedly eradicated by the Forestry Commission; armed with chainsaws and forwarders the team is removing the infected trees and burning branches so that the galls are unable to produce the next generation of adult wasps in July and so take hold and damage the coppice woodlands of the Weald. Lengths of plastic red and white tape and a blizzard of signs kept me from the section of woodland edge that I wanted to explore; I had neither the energy nor enthusiasm to flog all the way round the other way. I fear the little wasp will outwit the woodland conservators, not at Farningham, but probably elsewhere where it is galling away unnoticed. I also doubt many but woodland managers will search for it; it is not as pretty as a pink. Farningham Wood is a Local Nature Reserve and nestles, not on the top of a peaceful chalk down, where to stand and stare is as important as finding and recording pinks, but adjacent the M25 to the west and the M20 to the south; the London to Ramsgate train line runs to the north and a motorbike scrambling course abuts the eastern edge. 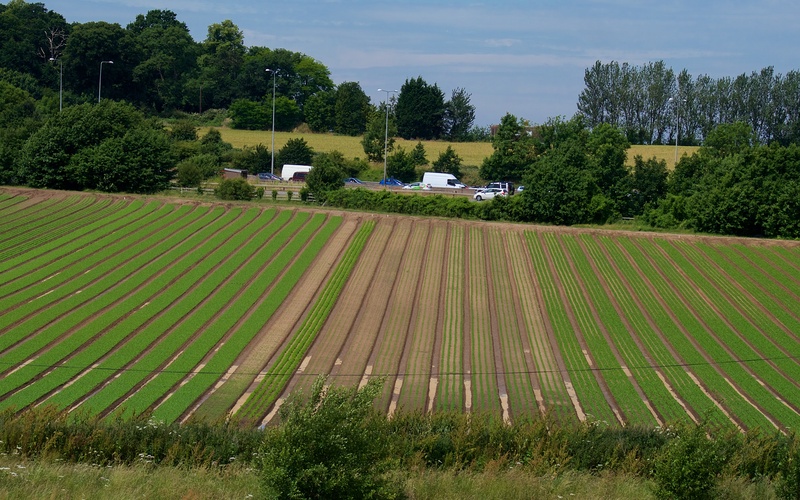 Electric pylons cross this confection and the neighbouring farmland is worked for, I think, salad crops with huge wide-armed watering cans on wheels. This is an old wood rich in wildlife slowly being squeezed dry in a landscape of Miltonian pandaemonium. One really has to want to see the damned pinks to put up with the drowning sounds and dull sights of London’s leading edge. 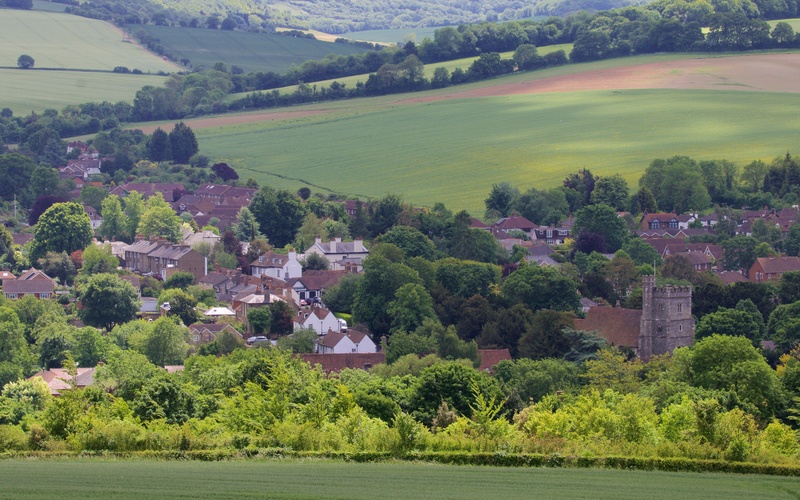 A tale of bucolic charm from the top of Farningham Wood? The reality is that the ancient woodland of Farningham squats within the modern world of intensive agriculture, motorways and the rest. 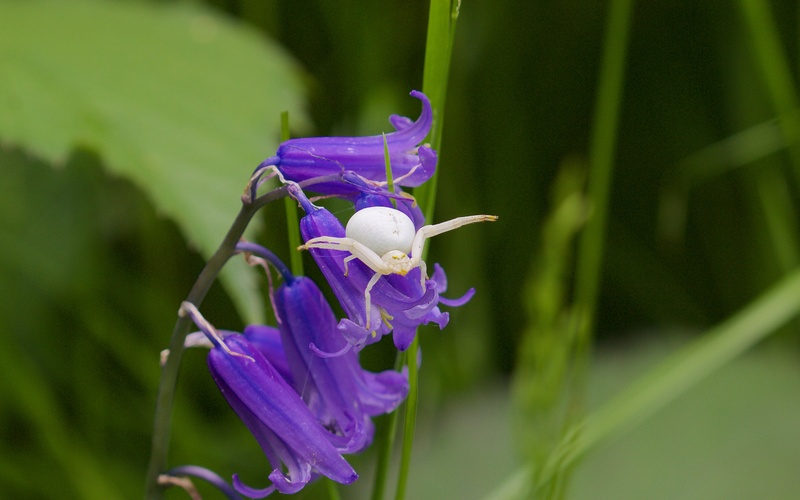 On a sunny woodland ride, when I was lost awhile, the shaded bluebells (Hyacinthoides non-scripta) were in their prime and a crab spider (Misumena vatia) sat astride a bell with its legs outstretched, welcoming a passing insect. A blue, I think a holly blue (Celastrina argiolusi) was sucked dry and lay dead beneath this white redeemer. Crab spider on a bluebell bell. 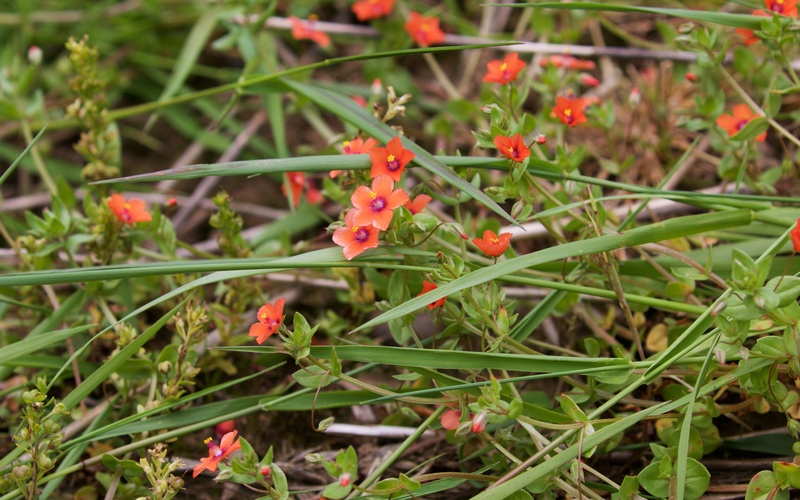 Some adjacent fields were left as fallow adjacent the wood, perhaps as some sort of buffer zone, and scarlet pimpernel (Anagallis arvensis) and other arable weeds ran wild. On the route home a corn bunting jangled from a field boundary and the occasional peacock (Aglais io) sat on the dry earth and the fields were bedecked with much poppy (Papaver sp.) and occasional purple salsify (Tragopogon porrifolius). Nearby an old, deserted farm with a field of mobile homes was filled with young farm workers from Eastern Europe readying themselves for the picking season.